The Newark High School Alumni Association features some items for sale that may be of interest, including Delaware State license plates (for Delaware residents only)., The NHS Walk of Fame which features personalized bricks placed around the NHS flagpole has been temporarily suspended. Specific information for merchandise and points of contact are provided on this page. For your convenience, you may pay in advance for the items on this page using your credit card by visiting the "PURCHASE ITEMS!" page of this website. PLEASE, PLEASE make sure that you submit any order forms to the address provided on the form. Have you seen them around town yet? Yes, that IS a Newark High School license plate. AND, yes, you may order one! Let us hear from you, soon! SHOW YOUR SCHOOL SPIRIT! 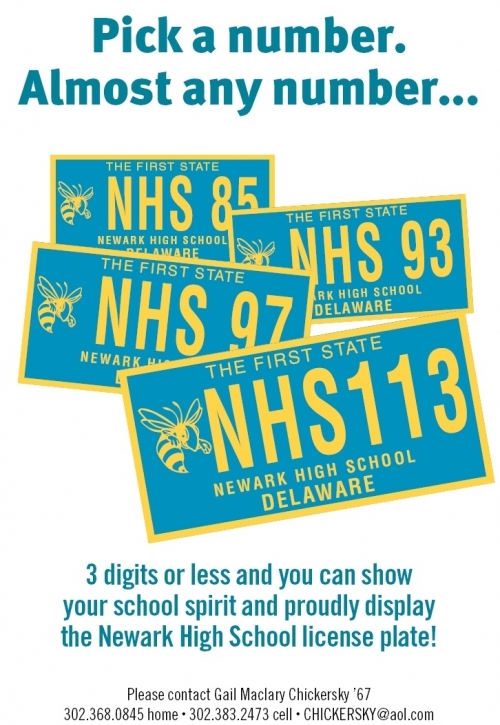 Display your pride in NHS on your vehicle's license plate. This is a fundraiser for the Alumni Association - you must have a vehicle registered in Delaware to participate. CLICK HERE for the form (the order form is a PDF document you can print or download). For further information you may contact Gail Chickersky. There is an option on the "PURCHASE ITEMS!" page of this web site to pay for your license plate. You may select a particular number, but your selection is subject to change based on previously issued license plates. 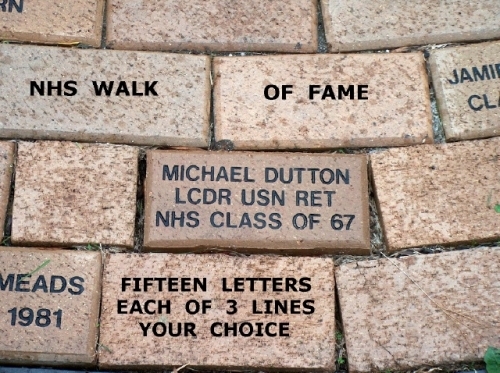 NHS Walk of Fame - Three lines or Two lines your choice up-to fifteen characters on each line!! We have temporarily suspended requests for bricks for our Walk of Fame at NHS. We will let you know as soon as the bricks are again available. We apologize for any inconvenience suspension of brick sales may have caused. For those of you who have already purchased bricks, perhaps you would like to have a photograph instead of a certificate to commemorate the brick you donated. The original forms did not include the option of having a photograph or a certificate, but the newer forms do. To get a copy of the form for ordering a Walk of Fame brick CLICK HERE!! to open the form in a separate window (You will need Adobe Acrobat reader on your computer to view the form. If you do not have that software, contact the Carpe Diem webmaster for more information). Bricks are installed once per year, in the Spring. Stop by and take a look - it's located around the flagpole in front of the school. Each goldtone brick is inscribed in black letters. Money raised will be used for the annual NHS Alumni Association Scholarship and other on-going programs. Please keep placing orders for the bricks! $75 for two lines or $100 for three lines (Maximum 15 letters and/or spaces per line). For additional info contact the Alumni Association at P.O. Box 836, Newark, DE 19715-0836, or e-mail Sally Pinto Krapf. All e-mail should read "NHS Alumni" in the subject field. Make check or money order payable to NHS Newark DE Alumni Association. 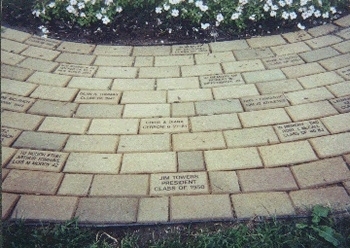 Or you may pay for your Walk of Fame Bricks using the EVENT Purchases page on this web site. NHS WALK Of FAME - Help us fill in those blank spaces! Place your order now!